Narrow House is a Ukrainian metal band which was started in 2009 as an atmospheric funeral doom project. The first album of the band titled “A Key to Panngrieb” was published in 2012 by Solitude Productions. After completing the debut album, band took a new musical direction, combining various doom metal subgenres (traditional, stoner, funeral etc). “Thanathonaut” is the latest work of the band and it features many instruments unusual for metal music, including live saxophone, cello, and double bass. It will be published by Solitude Prod. later this year on 19th of May. You can visit the official web site of the band at http://narrowhouse.net/ to spread the word by sharing via social media buttons. Thanks! PS. the first page of this topic is all about our first album, so you'd better skip it using this link. Last edited by Vault_13 on Fri Apr 18, 2014 8:03 am, edited 4 times in total. Thanks! I've just been informed that the album will be released on the 20th of August. Launched the timer on the web site as well. You can check out the full version of the song featured in the video here. It's downloadable as well. Oh, I totally forgot that you have to be registered to download from 4shared, sorry. Here's a direct download link powered by Dropbox. I would like to notice that one of the tracks we're putting on the album is actually a cover of Esoteric "Beneath This Face" song. We have added cello, keys and translated lyrics into Russian. It might be this is the only cover of Esoteric ever performed. Here is the album cover in bigger size. The album will be out in 30 days! Just 10 days! We have already received some cds from the label. Last edited by Vault_13 on Tue Oct 15, 2013 11:36 am, edited 1 time in total. Yeah, btw, we have a Twitter account. Most of the blah-blahs are in Russian but the important bits of news are always dubbed in English. I've translated the lyrics for the promo song to English if someone is interested. Just hoping I have chosen the right words so the text doesn't sound silly for native English speaking people. Through the veil of gray hair you see no familiar shapes. Doom has measured off your life with a short rope. When an ax will touch your neck with its sharp teeth. Low and rumbling with snarled vocals and depressive undertones, the music is not for the faint of heart. However like all good doom, despite the gloom there is still plenty of beauty to be found in the album. They got a bit confused about our style though. The full text can be found here. Yeah, btw, if someone here is feeling like reviewing our first album - drop us a line at narrow.house.ukr[at]gmail.com (just replace [at] with @). Now the album is available at ebay too. Here's the link. Narrow House is one of those bands that blows your mind, a band that has a powerful and twisted sound. A sound that is beautifully crafted, with quasi-perfect production, amazing lyrics and stellar musicianship. These arrangements are incredible and can not be put in to so little space as I have today. I am not sure we deserve all that praise but this guy is totally right when talking that funeral doom will not make us popular . The full text can be found here. Though Ukrainians Narrow House hail from a tradition of soul leeching, somber funeral doom, the sound they've adopted for their debut A Key to Panngrieb is actually far brighter, more atmospheric, and their wise incorporation of instruments like a cello and synthesizers helps give this music a far larger breadth than if they had merely trudged along with the same lifeless, disaffected lurch as so many others in this niche. Full text can be found here. The most detailed review by now. This band manages to capture the bleakness and drabness of an autumnal mist skillfully in their latest work, "A Key To Panngrieb". [...] The perfect soundtrack for the upcoming cold season. Although the review is written purely in Deutsch, Google Translate shows pretty good results in translating it to English (much better comparing to Russian version). Click here to check out the full googletranslated version. I'm quite interested about your band, tempted to review it... Send me a message if you want. I actually realized that most of the native English-speaking crowd doesn't dig the name of our band. But no fear, Metal Storm had cleared this out for wide audience in their last review of our album. A Key To Pangriebb is really well crafted, from song arrangements to sound. Narrow House almost effortlessly succeed in conveying the wide ranges of doom, from fragile beauty to crushing loss to abject horror. The full version can be found here. Made some shirts for girls too. Might be in October there will be black shirts as well. I’m not entirely sure whether I’ll often return to the gloomy Panngrieb or not, but I’m sure this magical journey is worth a try. However, I’m pretty sure that NARROW HOUSE’s next visits to the murky underground are very promising and something to look forward to. The full version of review is in their native language and Google Translate handles it pretty badly, so I guess I will translate it to Russian first. Last edited by Vault_13 on Tue Sep 25, 2012 7:30 am, edited 1 time in total. ESOTERIC child (which also contains a title, "Beneath This Face" convincingly), this group practice a Funeral Doom very distinct in its statement, totally desperate, requiring slow and devoid of compromise. NARROW HOUSE is not intended to upset the rules fairly limited in this sub-genre: ultra slow tempo, towering riffs, mammoth and rhythmic throat singing. Not a big review though. Full version is here, French language inside. Good news for American people around here. Our album will be available through Hypnotic Dirge Records distribution shop soon. This mean that you will be able to order CD from North America and not Russia. The fourth and final track on this release, 'Behind the Mask This' is a great finale. By this point in the CD, I had broken down into tears twice because it was such an emotional roller coaster of sound. Read the full version here. Thank god they don't use Dutch to write their reviews. On their own terms, Narrow House are the most accomplished new funeral doom band that I have heard in some time: They use the cello and keyboards beautifully to ease the flow from chord to chord in the riff, and the vocals have a fine tone to them. Full version can be found here. Solitude Productions once again crosses our path with a mighty fine funeral doom album, this time from Ukraine. 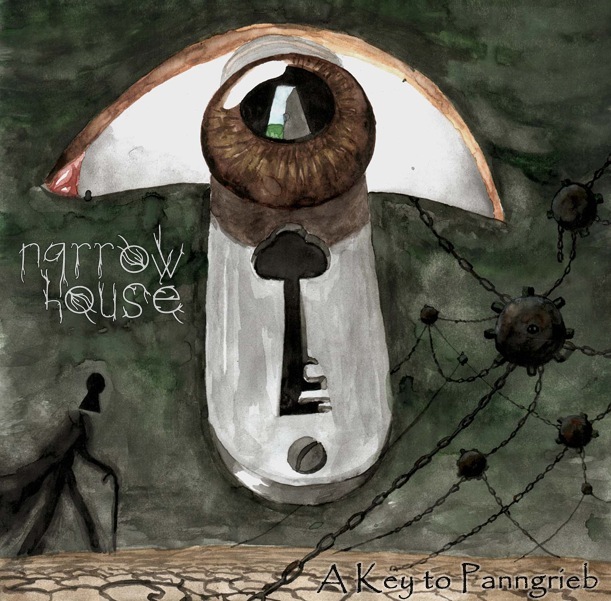 When looking at the cover of Narrow House’s ‘A Key To Panngrieb’ I am sure funeral doom is not something that will spring to mind. Pure funeral doom is really isn’t. It’s more psychedelic funeral doom such as we know it from bands such as Esoteric and Faal and in the quieter almost ambient passages of Shape Of Despair. Our album is finally available through Hypnotic Dirge Records distribution shop. So if you happen to live in North America and would like to purchase our album - this is the best option you have. Click here for more details. The album is big, open and spacious like the musicians are not even playing in the same country, let alone the same studio. There are huge gaps in every guitar strike, cymbal and drum hit which makes this seem much slower than what is actually is. They bleed out their music so listening to this is like being strangled to death very very slowly which is a killer hook and perfect for a funeral doom exercise. The full version can be found here. Surprisingly detailed review. The guy who wrote it had a heart attack some time ago and he is short on money, so if anyone here feels like supporting the fellow doom metal fan (he is actually an owner of that website), throw some bucks to his PayPal. So, what do we have next... Uh, yes, the review from Hungarian webzine "Femforgacs". Can't point out a bit for the quote, as this review is written in Hungarian (yeah, seriously) and it seems that Google Translate can't handle it in full scale. So here is the direct googletranslated link. It’s virtually flawless in structure, flow, composition, delivery, and production. Narrow House create such a gravitational force with their combination of suffocating heaviness, dreary phantom atmosphere, and solemn melodies that it’s damn near impossible to escape it’s pull into the abyss. Another non-translatable review, this time from Lithuanian "Hell Music". I'm sure you will be amused with the googletranslated version which can be found here. During these 45 minutes of funereal exile, the 'Russian school', let us say, comes in good shape, four themes touched very competent, well-structured, with a good balance between the keys and guitars and a well that throaty voice, sparsely, alternating with a clear tone and lean a little to the tortuous. The full version can be found here. Thankfully, the English translation makes sense. 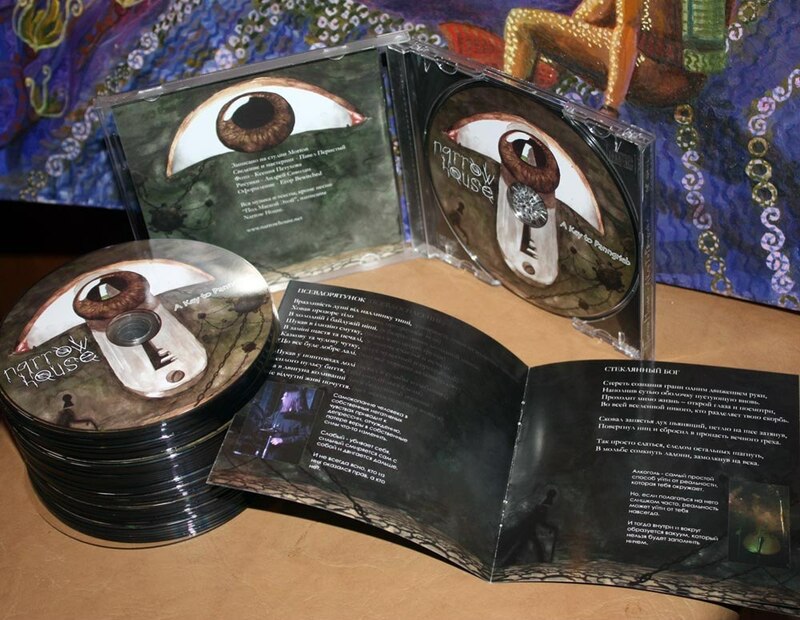 Good news for European doom fans - this online-shop based in Czech Republic sells some copies of "A Key to Panngrieb" now. You might be more comfortable ordering it from there. Who would know, Japan is interested in funeral doom too: this online-shop is selling "A Key to Panngrieb" as well.